ORLANDO, Fla. (AP) Rodney Hood doesn’t care whether he starts or comes off the bench. 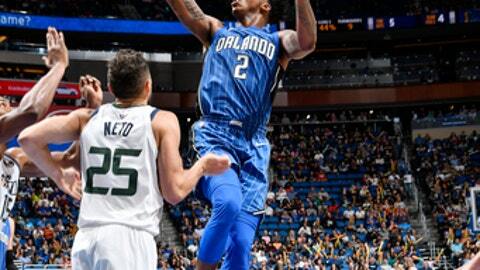 Hood scored 31 points, Derrick Favors had 25 points and 11 rebounds and the Utah Jazz routed the Orlando Magic 125-85 on Saturday night. The 25-year-old Hood was 12 for 21 from the field in his highest-scoring game of the season. He has made 10 starts in 15 games, but he gave Utah a big lift while coming off the bench against Orlando. The Jazz had lost three in a row and seven of eight. It was their first road win of the season. Hood had 19 straight points for Utah over one stretch that went from the end of the third through early in the fourth. ”I felt good,” he said of his scoring spree. ”I got an easy one for the layup and my teammates were just finding me and I was able to get shots to go down. Aaron Gordon had 18 points and nine rebounds for Orlando, and Terrence Ross finished with 12 points. The 40-point margin matched the Magic’s worst home loss in team history. Orlando has dropped four in a row and six of eight. After a strong start to the season, the Magic have been hurt by poor spacing, lack of rhythm and subpar defensive play – the same issues they dealt with last year. Orlando shot 39 percent from the field, compared to 48 percent for Utah. The Magic also had only 13 assists on 31 baskets, while the Jazz finished with 31 assists. Utah coach Quin Snyder didn’t want to make too much of his team’s first road win, but he also recognized the potential significance of the performance. ”We haven’t won on the road and that’s the reality of what’s going on,” he said. ”In spite of that reality we have to keep talking about getting better. Utah has struggled with injuries during the early part of the season, but starting point guard Ricky Rubio and forward Thabo Sefolosha returned after missing Friday’s 118-107 loss to Brooklyn. Rubio was out with a sore Achilles, and Sefolosha was sidelined by a sore right knee. The Jazz took advantage of the Magic’s lack of ball movement and poor defensive play to jump out to a 63-48 lead at halftime. Favors had 17 points on 7-of-7 shooting in the first half. Hood had 10 points at the break. Jazz: Joe Johnson (right wrist tendon instability), Rudy Gobert (right tibia contusion) and Dante Exum (left shoulder surgery) were out. … The Jazz went 9 for 9 at the free-throw line in the first half. Magic: Backup point guard D.J. Augustin returned after missing the previous seven games with a left hamstring injury. … Rookie forward Jonathan Isaac missed his third straight game with an ankle injury. … Guard Mario Hezonja suffered a head laceration during the second quarter, but he returned in the second half. Jazz: Continue their four-game road trip at Philadelphia on Monday. Magic: Finish a two-game homestand against the Indiana Pacers on Monday.